By late 2007, benchwork had been completed along the west wall of the basement (the lower wall of the track plan) as shown in these two pictures. The upper picture is looking towards the water heater (lower left on the track plan) and the other picture is looking in the opposite direction. In the picture above, there is a funny section of benchwork in the foreground and you may be wondering what this is all about. That particular location will have a river spanned by a double track truss bridge (Atlas') to represent where the B&O crosses the Cheat River in Rowlesburg, WV. The depression in the benchwork allows for the scenery in the riverbed. We'll see the track approach, and then finally cross the gorge in later photographs. You might also be wondering why such slow progress? Several reasons actually. First, I am a slow and deliberate worker. 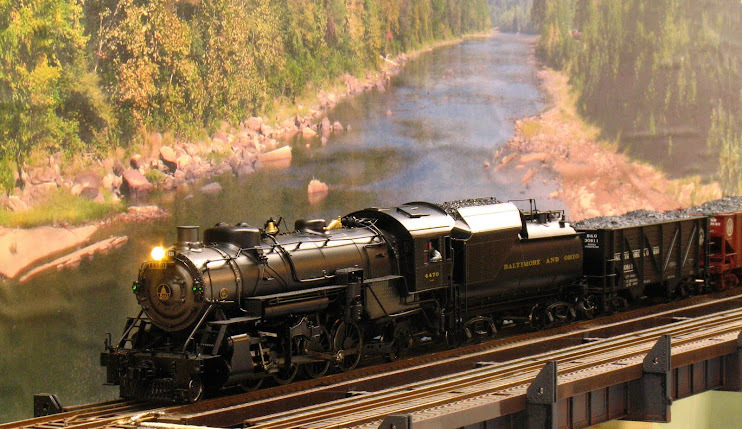 Second, at this time I had not built a layout in almost 40 years, since I was a teenager; and although I had read about every advance in layout design and construction during that time, this was my first opportunity to put that knowledge into practice. Finally I took a hiatus from building the railroad in June, July and August of 2007 because of preparation for, and then taking an overseas trip. In these photos, I have not yet installed the layout lighting or lighting valence. The basement, as built, had limited electrical service. I was able to bring only one more circuit into the basement as there was only one available circuit breaker position in my main service box, and I did not want to get into replacing the main service. Furthermore, lighting a layout of this size would have taken at least 3000 W of incandescent lighting, quite possibly a lot more. And I still plan, eventually, on moving (you never know in today's job market) so I did not want to invest in a lot of immovable infrastructure. The solution that I came up with was to light the layout with 4' long, dual-tube, "shoplight" florescent fixtures and tie these lights into the existing overhead lighting circuit. While this works well, I really hated to give up the dramatic and directional lighting possible with incandescent illumination. A minor side benefit of florescent is that I could use 5000K color temperature lights which render colors much more accurately than incandescent. These lamps are not particularly expensive when bought in 10 packs at Home Depot for about $30. I made sure that I purchased shoplight fixtures that could use T8 bulbs. The T8s are the narrow ones which only use 32W vs. the T12 'fat' tubes at 40W; and the T8s actually give off more light.